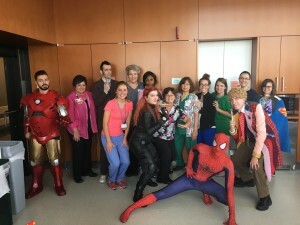 The day before Boston Comic Con we partnered with the convention and our sister group Boston Superheroes to visit the pediatric wing at Spaulding Rehabilitation Hospital in Boston. 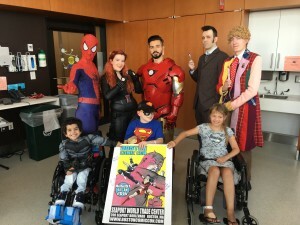 Initially we were invited to visit Matt, a Marvel fanatic and Whovian (and really great Master cosplayer) who was injured in a car accident and couldn’t attend the convention. Eventually this just involved into a meet and greet with many kids staying at Spaulding for treatment, and everyone was very happy to see us. The Boston Whovians are always available for charitable events in Boston and around Massachusetts, so be sure to contact us if you need a little Whovian themed visit. We want to thank our partners at Boston Comic Con and Boston Super Heroes, especially Anthony Ferranti and Pat Covey, and of course the entire staff at Spaulding Hospital for all the work they do; they’re the real super heroes! ← We have a TARDIS console!